June 17, 2016 – An Orbital Maneuvering System engine is being vibration tested at NASA’s Johnson Space Center in Houston. The vibration testing will help ensure the engine can withstand the loads induced by launch on the agency’s Space Launch System rocket. This Orbital Maneuvering System engine was previously used on the space shuttle to provide the thrust for orbital insertion, orbit circularization, orbit transfer, rendezvous, deorbit and abort situations and flew on 31 shuttle flights. The engine flew on 19 space shuttle flights, beginning with STS-41G in October 1984 and ending with STS-112 in October 2002. 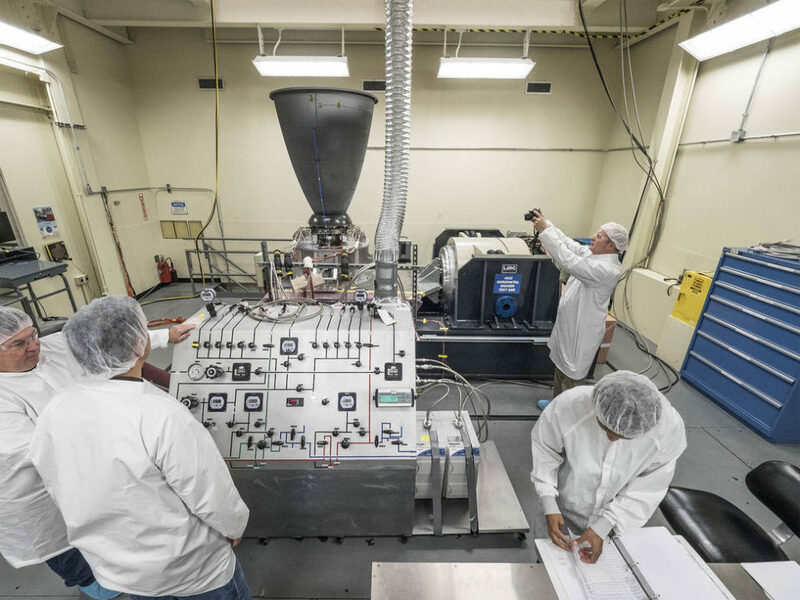 Once vibration testing is complete, the engine will be shipped to NASA’s White Sands Test Facility in New Mexico, where it will be fired, to qualify the engine for use on Orion’s service module. This summer, a second Orbital Maneuvering System engine will also be tested before it is supplied to ESA (European Space Agency) to integrate into Orion’s service module, which will power, propel and cool Orion in space, and also provide consumables like air and water for future crews. ESA and its contractor Airbus Defence & Space are providing the service module for Exploration Mission-1, a 2018 mission of the Orion spacecraft and SLS rocket that will send the spacecraft about 40,000 miles beyond the moon. ← Countdown To Jupiter Has Officially Begun!